It's the most, won-der-ful time, of the year – why yes, it's bribe time, during which us arts writers supplement our meager earnings with a random assortment of stuff posted to us from complete strangers. That's not to say that we don't approach every anonymous bribe-box with some degree of trepidation: one day we know the horse head will arrive. But not this day! On this day, we received a delicious (though slightly squashed) lemon drizzle cake from M&S, and a lovely rhyming poem from the sisters Donnachie. Their autobiographical play 3 Years, 1 Week and a Lemon Drizzle tackles older sister Alexandra's struggles with an eating disorder, and the impact it had on their relationship. Lemon Drizzle (the play, not the cake – that's ours, and long gone buddy) will be playing at Underbelly until 27 August. 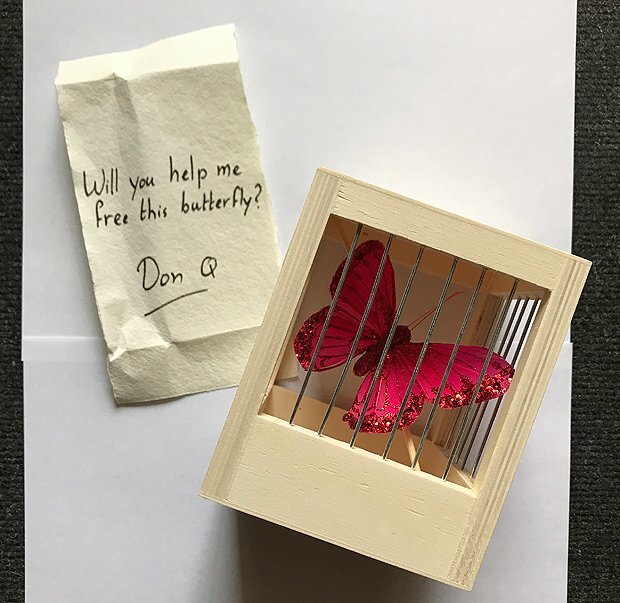 After such an easy start, we're slightly more perturbed when a glitter-gilded butterfly entombed in a wooden cage shows up at our door, alongside a handwritten note from 'Don Q' which bades us, 'Will you help me free this butterfly?' It's raining out, so we can't, but you can go see Patchwork Theatre's production of Don Quixote, which follows a man who strives to make the world a better place, at the Assembly Roxy until 26 August. A few days on and things are getting a bit tense in the office: the snack stool overfloweth, as we attempt to eat our rising nausea away with fistfuls of Skittles. Luckily who should pop by but the one and only Aaron Calvert, who gives the office a hands-on preview of his show Declassified. He takes us through a mindfulness and deep breathing session, and we're starting to feel very zen indeed, until he puts our co-worker Maria to sleep with a snap of his fingers, and now we're freaking out again (and not a little jealous). His hypnosis show runs until 26 August at the Gilded Balloon at the Museum.